Registering solid gains together with our partners is how UN women describes the progress made on many fronts. There is an informative slide show, 2014 in Review – with a country or region named, a picture and descriptive paragraph. 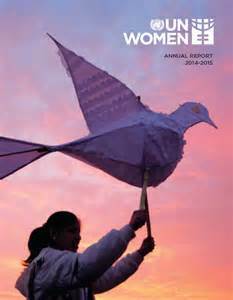 On page 23 the grantees for 2014 from the UN Women’s Fund for Gender Equality are listed and on page 25 the UN Trust Fund to End Violence against Women selected grantees are also listed. The Trust Fund to End Violence against Women currently supports 95 initiatives in 71 countries and territories with grants totaling US$56.3 million. it is heartening to read that girls needs are integrated within the report. Check to see if any of these programs are in your country. Page 27 reviews the top 20 government donors and pages 31 and 32 shows the locations of UN Women Offices in the world.